Qualcomm Atheros AR9002WB-1NG Wireless Network Adapter is a Network Adapters hardware device. The developer of this driver was Qualcomm Atheros Communications Inc.. The hardware id of this driver is PCI/VEN_168C&DEV_002B&SUBSYS_2C371A3B; this string has to match your hardware. 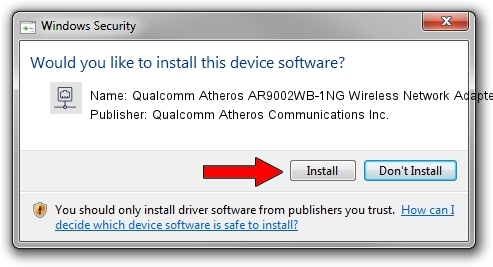 Download the setup file for Qualcomm Atheros Communications Inc. Qualcomm Atheros AR9002WB-1NG Wireless Network Adapter driver from the link below. This download link is for the driver version 10.0.0.293 released on 2014-06-22. Run the driver setup file from a Windows account with administrative rights. If your UAC (User Access Control) is running then you will have to confirm the installation of the driver and run the setup with administrative rights. Restart your PC and enjoy the updated driver, as you can see it was quite smple. Driver rating 3.5 stars out of 38360 votes. 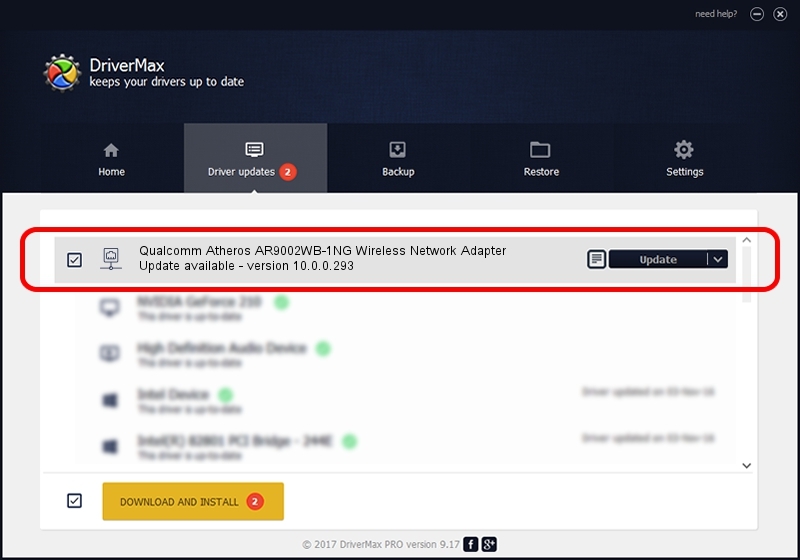 Open DriverMax and click on the yellow button that says ~SCAN FOR DRIVER UPDATES NOW~. Wait for DriverMax to analyze each driver on your computer. Take a look at the list of driver updates. Search the list until you locate the Qualcomm Atheros Communications Inc. Qualcomm Atheros AR9002WB-1NG Wireless Network Adapter driver. Click on Update.